Minimum password length: This number represents the lowest number of characters the password must contain. Minimum character classes used: This number represents the minimum number (up to four) of character classes (lowercase, uppercase, numbers, and special symbols) the password must contain. Must change password after: This duration can be set in various units (days, years, months, etc.) and must be entered using International Organization for Standardization (ISO) designators (see table below). Cannot reuse passwords for: This duration can be set in various units (days, years, months, etc.) and must be entered using ISO designators (see table below). Lockout after unsuccessful login attempts: This number represents the number of failed logins before the user is locked out. Lockout lasts for: This duration can be set in various units (days, years, months, etc.) and must be entered using ISO designators (see table below). You can manually override password lockouts if necessary. 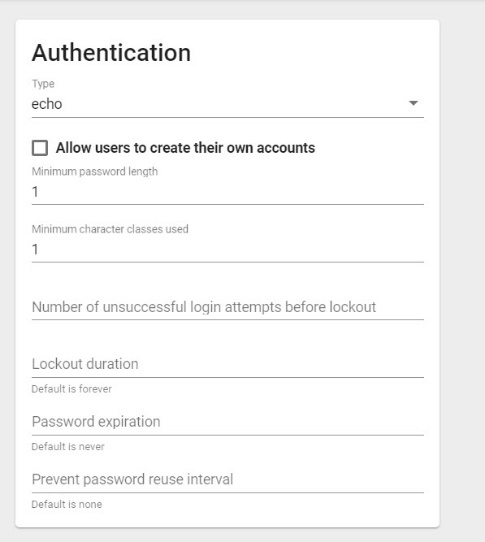 The Authentication tab you can “Allow users to create their own accounts” and/or set password policy for your domain. If selecting set password policy use the ISO duration designators below to configure durations of this policy. Enter P (period) if you want to use days, weeks, months, or years as your unit of time, and PT (period, time) if you want to use seconds, minutes, or hours. Enter the number of units that you want to use. D (days), W (weeks), M (months), Y (years) if you used P.
S (seconds), M (minutes), H (hours) if you used PT.